Charlotte Helms » News for Juniors! 3. Think about which teachers you will ask to write recommendations for you and perhaps ask them if they write them over the summer. 4. Complete several drafts of your college essay. 5. During the summer, start working on the individual college supplements.. The “best” summer opportunity awaits current high school juniors on the campus of Appalachian State University. The Martha Guy Summer Institute for Future Business Leaders (MGSI) has a solid history of inspiring students through exploration of the business world, and we will begin accepting applications for our 2019 Cohort on December 1, 2018. We are seeking students who have a sincere interest in business as a college major and demonstrate leadership potential. Some candidates have an entrepreneurial spirit, or have unique or extensive part-time work experience. Also consider your most competitive students among under-represented groups and populations. Interested students should demonstrate academic achievement. Students who embrace and appreciate new people, opportunities and experiences are ideal for MGSI. They should also be well-prepared to be away from home and able to manage a demanding schedule. Please offer this opportunity to current juniors – only current juniors are accepted for this program. Please make announcements, post on your website, and include MGSI in your newsletters, and share the opportunity with teachers and club advisors who work with students described above. Parents want to know! Share this information with your school’s parent organizations. Please reach out and encourage at least one student to apply! Stanly County Schools will partner with our families and communities to provide our students an educational foundation to promote career and college readiness, lifelong learning, and citizenship. Encourage your students to apply now! The application for the Wilson College of Textiles Summer Textile Exploration Program (STEP) is open for high school juniors going into their senior year. The Wilson College holds five one-week sessions of STEP each summer. Participants live on-campus, learn about our degree programs, the admissions process, scholarship opportunities and work on a project related to one of our majors. The program cost is $250 for each participant; limited financial aid is available. We encourage you to share this opportunity with your students. Each student has the opportunity to rank their level of interest in the subject areas listed below, and will complete a project pertaining to that subject. To learn more about STEP please visit our website. 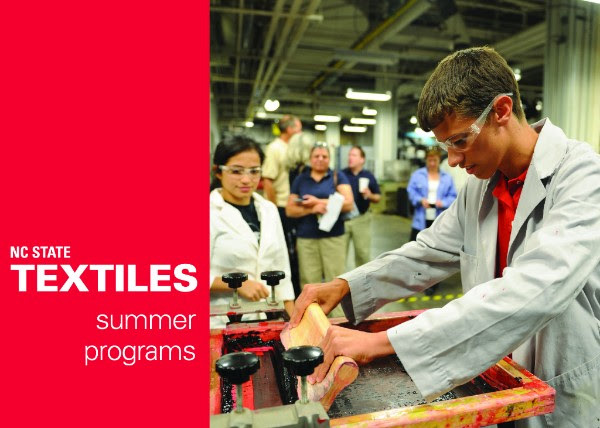 If you have questions, please contact Shannon Tart at textiles-recruitment@ncsu.edu. Applications due April 1, 2019. The Wilson College also offers a two-day workshop, Polymer Camp, for high school juniors interested in physical sciences, engineering and attending NC State. This is a great opportunity for your students to learn more about our Polymer Color Chemistry, Textile Engineering or Textile Technology degree programs. The application opens March 1, 2019 and closes May 31, 2019. To learn more about Polymer Camp please visit our website. If you have questions, please contact Lakisha Patterson at lypatter@ncsu.edu.